If it’s not been obvious by now, Champagne is my go to drink. I love it for so many reasons. The bubbles are refreshing, it’s light, and it’s perfect for every occasion. I catch a lot of flack for it but hey, I’m just fancy and I need my bubbles. Wine is great but champagne doesn’t give me that foggy/drinking feeling, it just taste good and makes me sparkle ha ha. Typically, I enjoy it as is, but every once in a while I’ll spruce it up with something simple. Elderflower and St. Germain are my two favorites to add but for those of you who like a something fruity, this recipe is for you! 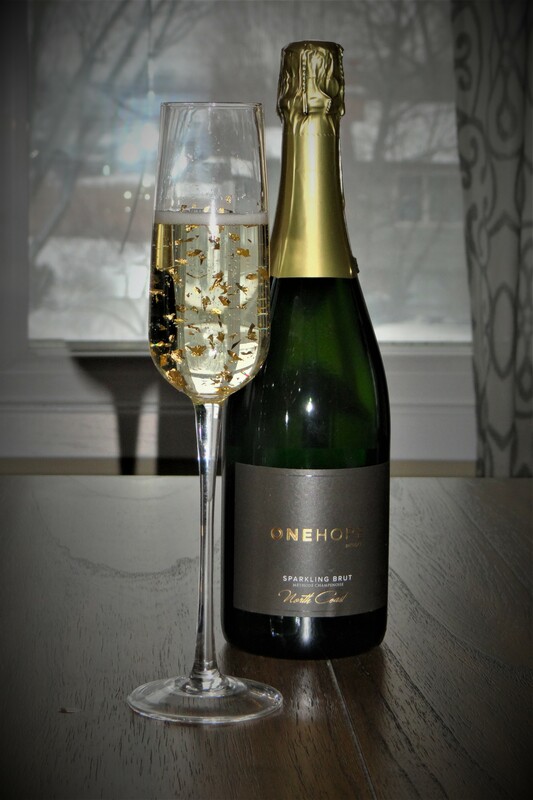 When you choose ONEHOPE Champagne, your guests and you will be giving back to WHYHUNGER and helping feed starving children in America. This is why I fell in love with this company. They make quality products and have an amazing mission. I am not kidding you, I cried a little when I watched their introduction video on YouTube. Every bottle is beautiful, their packaging is beautiful, AND their gifts are unique with something for everyone, even the non drinkers. They put so much thought into the companies they partner with and every way that they can possibly give back. I know I’m going on and on and yes I do get paid to sell this wine but I honestly am in love with this company and their product, and I think you will become obsessed too once you try it! The CORE Brut is great! It’s also one of my favorite crowd pleasing champagne’s, sweet enough for non champagne drinkers but it’s still dry for those like me that don’t like sweet drinks. I might also recommend the Reserve Sparkling Brut for the more sophisticated pallets. So the first idea for New Year’s Eve, is to just simply add gold flecks for fun! I found some at Michael’s that you can swing by and get but they weren’t nearly as cool as what I found on amazon! Click the picture below to buy. It was really simple to use and the flakes were the perfect size! Finally, here is a New Year’s Eve Spritzer idea for those of you who don’t love cranberry or OJ which I see a lot of out there. Let me know what you think and have a great New Year’s Eve Celebration! Option: If you like a sweeter drink, you can add a sugar cube to the bottom. If that’s what you want, start the drink with the sugar cube.